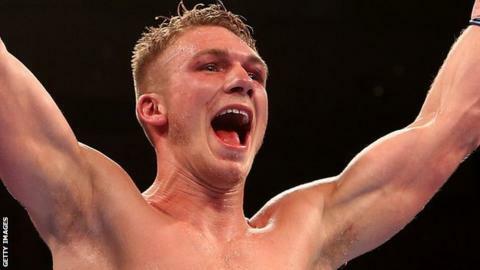 Nick Blackwell retained his British middleweight title with a unanimous points decision at the end of a gruelling bout with Jack Arnfield. Arnfield, 26, only took the fight at eight days' notice but recovered from a fifth-round knockdown and a cut eye to take his opponent the full 12 rounds. Blackwell, 25, took some punishing uppercuts but had the greater power in the second defence of his crown. The judges scored it 117-110, 117-111 and 115-112 to Blackwell. "Not my best performance but hats off to Jack Arnfield, who did himself proud and made it one tough night," said the champion. Arnfield took the bout after Elliott Matthews was forced to pull out after getting cut in training. "Great fight," he said. "In a few years, we can do this again for something bigger and better. Not at eight days' notice."